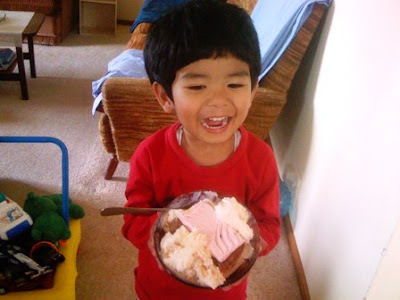 What do you get when you dump cake and ice cream into a single bowl? A smile from your son and wife! This actually reminds me of the burger bun with ice cream in it, a simple yet enjoyable concoction which I first had as a kid in Dagupan, the Philippines. Yummy stuff. And this is actually something you can whip up when you have guests over. 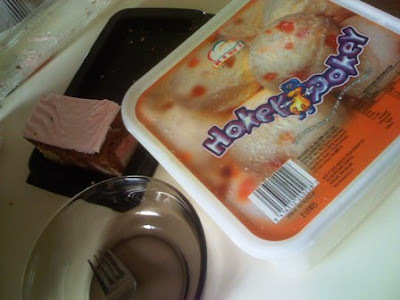 Instead of simply having plain ice cream, use it as topping on cake. Or even loaf bread! Jazz it up some more with chocolate bits or syrup. I wonder what it would taste like with jam on top?